A modern Mason & Hamlin piano of today is more than just a beautiful instrument. It is a symbol with a heritage hearkening back to the excellence of the past and the innovation of the future. From its origin in 1854 up through today, we at Mason & Hamlin have continued to improve the quality of our pianos through many refinements, enhancements, and innovations. 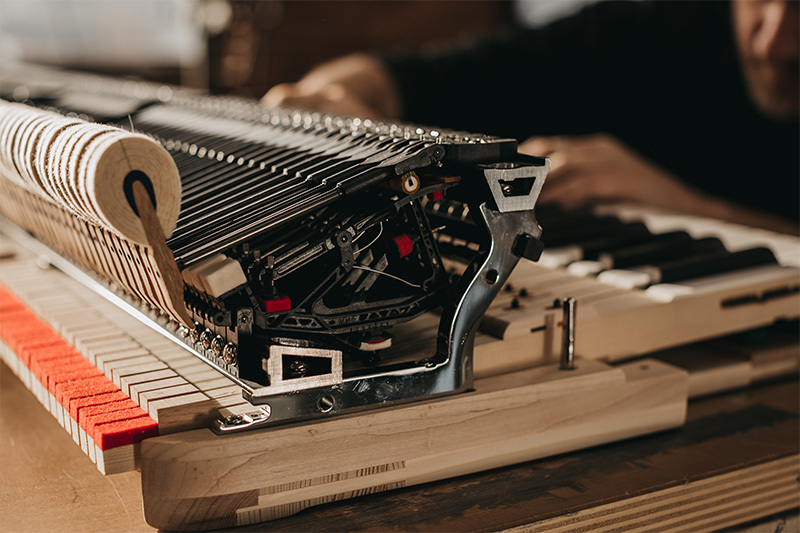 When the company was acquired by the Burgett Brothers over two decades ago, they standardized the pianos’ aesthetics with a classic and uniform look inspired by the iconic Mason & Hamlin BB of the 1920s. Production of pianos was also expanded from two grand models into a complete line of six pianos that includes an all-new upright Mason 50 and redesigned B 5’4’, AA 6’4”, CC 9’4” pianos. Continuing a craft of tradition, while striving to improve and incorporate modern innovations, Mason & Hamlin has introduced full-perimeter plates across our entire line to deepen and support their power and melodic sound, which was originally a feature limited to the BB. 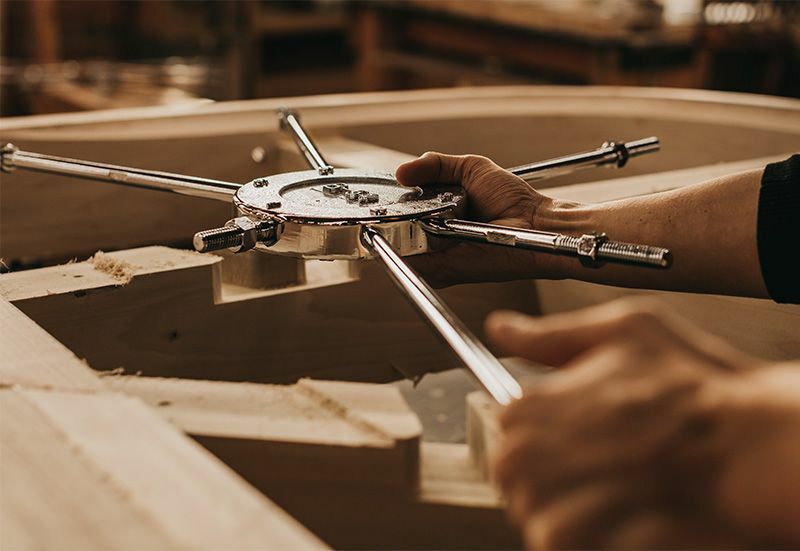 The tension resonator—a Mason & Hamlin exclusive—was redesigned and enhanced to preserve the piano’s crown and structure with an even greater level of stability and reliability, and is standard in every model of piano we produce. Unlike every other piano manufacturers in the world, we developed a fully state-of-the-art advanced composite action with hard bushings and epoxy carbon fiber shanks that completely outclass their wooden counterparts in durability, consistency, and reliability—as well as come installed in each of our pianos. When you purchase a modern Mason & Hamlin, it is not only a piano constructed with the finest materials, but a quality instrument that preserves a tradition of sound and legacy of longevity. Today, all of our redesigned pianos are based on new scale designs that bring each piano to the modern age, while hearkening back to Mason & Hamlin’s venerable heritage. (Pre-1932) - Hard Rock Maple. (Post-1932) - Transitioned to softwood (Mahogany, then Poplar post-1960s) which absorbs energy from the soundboard, making the piano less powerful. Hard Rock Maple, as was originally designed. Hard Rock Maple provides excellent sound rebound and and grants the piano better sustain and power. (Post-1932) - Not tapered, with few exceptions. Did not allow the soundboard to vibrate freely, which meant less sustain and less power. Tapered, as per the pianos designed and made between 1910-1930. Soundboard tapering allows for bigger sound, more dynamic range, enhanced power, and better sustain. (1920s-1985) - Nitrocellulose Lacquer, which was soft and widely used. Lacquer and Polyester Resin, which is seven times harder and more durable than Nitrocellulose Lacquer. Plated steel, and cast iron with nickel plating. Steel with copper plating, which corrodes and rusts over time. Stainless steel; extremely rust and corrosion resistant. (1932-1985) - Plastic, not full-length standard. Genuine ebony, cut to full-length standard. (Post-1930s) - Reduced size, used smaller rods and painted silver. Increased size to original design by Richard Gertz in the early 1900s. Made with triple-chrome for a clean and durable finish. Nitrocellulose lacquer—minimum protection against changes in humidity. 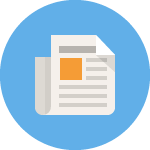 Polyurethane—three times stronger than Nitrocellulose against changes in humidity. Small castors (for size of the piano). Medium-sized double-needle bearing castors with ball bearing swivel, lockable. Pedal mechanism used wooden dowels with felt bushing. Pedal mechanism redesigned to use investment casting with nylon bushings for improved performance and longevity. Long planks of Spruce that were tongue and grooved, causing instability from humidity swings. Poplar plywood with Spruce top and bottom panels, resulting in a more rigid and stable construction. Wood construction with felt bushings, susceptible to changes in humidity. Full Wessell, Nickel & Gross composite action with hard bushings. Highly responsive with three times longer life expectancy than wooden actions. Humidity has no effect on the action and requires minimal maintenance. (Post-1932) - Made in-house and low quality. High-quality Wessell, Nickel & Gross hammers. (Post-1932) - Plate finish rough and poor quality. Except for BB, plates lacked full-perimeter design. Smooth, high-quality plate finish. Full-perimeter plate design expanded to entire piano line.